Notes is a notetaking app developed by Apple. It is provided on their iOS and macOS operating systems, the latter starting with OS X 10.8 Mountain Lion. It functions as a service for making short text notes, which can be synchronised between devices using Apple's iCloud service. The application uses a similar interface on iOS and macOS, with a textured paper background for notes and light yellow icons, suggesting pencil or crayon. Until 2013, both applications used a strongly skeuomorphic interface, with a lined paper design; the Mountain Lion version placed this inside a leather folder. This design was replaced in OS X Mavericks and iOS 7. 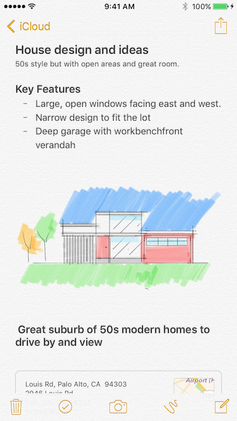 Starting with iOS 9, Notes received a significant functional overhaul; iCloud sync (instead of IMAP; in-line with the OS X 10.11 version), the ability to create sketches (and later, support for Apple Pencil), advanced text formatting options, several styles of lists, rich web and map link previews, support for more file type attachments, a corresponding dedicated attachment browser, and a system share extension point for saving web links, images, etc. As of iOS 9.3, individual notes can be password-protected (with the ability to use Touch ID to unlock all notes on compatible devices), however only one password can be set for all notes locked henceforth. The password syncs across compatible devices. In iOS 10, Notes now has a collaboration feature for many people to work on a note at the same time. The update to Notes released with iOS 11 adds tables, pinned notes, a document scanner, graph and lined paper, monospaced text support, handwriting search, and improved integration with Apple Pencil. Tapping the Pencil on the Lock screen will bring up a new note with drawing active; the Pencil can also be used while in the Notes app to start an inline drawing. Prior to Mountain Lion, Mail on macOS supported a mailbox containing notes, which was synced with notes in the Notes application in iOS. This situation was a kludge: as Mail already implemented the IMAP mailbox synchronisation protocol, it could also sync notes with minimal additional work. In Mountain Lion, notes were moved to a separate Notes application. Created notes are synced through all the user's Apple devices through the iCloud service. Notes can be arranged in folders, and pinned to the user's desktop. When the application is closed, the pinned note still remains. Additionally, unlike the iPad, iPhone, and iPod touch version, the OS X Mountain Lion Notes application allows for images to be embedded within notes. Originally, notes could be created in three different default fonts - Noteworthy, Marker Felt, and Helvetica. Users could also add custom fonts by visiting the "Show Fonts" menu. The menu allows users to change text size, format lists, choose the alignment (left, center, justify, or right), assign a writing direction, and indent text. Attachments, images, and hyperlinks can also be added into a note. Attachments cannot be viewed on iOS devices. As of OS X 10.11, Notes received a significant functional overhaul (in-line with the iOS 9 version), with major features including iCloud sync, the ability to view sketches created on the iOS counterpart, advanced text formatting options, several styles of lists, rich web and map link previews, support for more file type attachments, a corresponding dedicated attachment browser, and a system share extension point for saving web links, images, etc. As of OS X El Capitan 10.11.4, individual notes can be password-protected, with the password syncing across compatible devices. The update to Notes released with macOS 10.13 adds tables. Reminders - Apple's reminder service, also using iCloud. ^ "Inside iOS 9: Apple's Notes app is greatly enhanced with drawings, lists, pictures, links & more". AppleInsider. Retrieved April 24, 2016. ^ "Keep your notes secure with password-protection - Apple Support". support.apple.com. Retrieved April 24, 2016. ^ "How to collaborate on Notes in iOS 10". Macworld. Retrieved November 26, 2016. ^ a b Zaib Ali. "5 Awesome New Features iOS 11 Brings To The Notes App: Its A Big Plus". ^ a b c d e "10 New Features in iOS 11 Notes App". iPhone Hacks | #1 iPhone, iPad, iOS Blog. July 5, 2017. Retrieved August 30, 2017. ^ Gruber, John. "Mountain Lion". Daring Fireball. ^ "OS X Mountain Lion - See everything the new OS X can do". Apple. Section "Notes". Retrieved February 22, 2012. ^ Titlow, John Paul. "Apple's Convergence of Desktop and Mobile Continues With Mountain Lion". ReadWrite. Archived from the original on April 21, 2012. Retrieved April 24, 2012. ^ Breen, Christopher (July 26, 2012). "Up close with Mountain Lion: Notes". Macworld. Mac Publishing. Retrieved September 3, 2012. ^ "Hands-on with Notes 4 in El Capitan". Macworld. Retrieved April 24, 2016. ^ "How to use tables in Notes in macOS High Sierra". iMore. Retrieved September 11, 2017.